The Panasonic KX-TG6521 is a latest addition to the Panasonic range and builds on the previous popularity of the KX-TG6421. The KX-TG6521 adds to the specification of the 6421 with improved features such as a one touch ECO mode with icon indication. 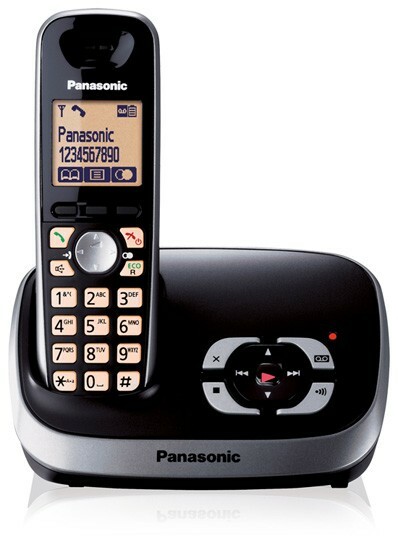 Panasonic have also upgraded the talk quality meaning that this mid range phone offers outstanding value for money. The KXTG6521 is a superb home phone that fulfils the requirements of most home users. It has a full basic feature set implying it is clear-cut and straightforward to use with an easy to navigate menu and call set up. The Panasonic KX-TG6521 series is fully repeater compatible which allows you to extend the range of your phone if required, the system can expand to accomodate up to 6 handsets; including the main phone, and both the main phone and additional handsets have wall mounting fixings built in. Features carried over from the KX-TG6421 model include a 20 minute answering machine with remote access, handset speakerphone, call transfer and intercom (when 2 or more handsets are present on the system) and visual ring indicator (LED). Answermachine messages can be accessed via either the base station or the handset, and can also be remotely retrieved from an external phone using the remote playback feature. The base station includes a message indicator that allows you to easily see when new messages have been left. The Panasonic KX-TG6521 can be personalised with up to 16 polyphonic ringtones, has caller ID with a 50 name & number call log (where caller ID is available) and a large 100 name and number phonebook that can be transferred between compatible Panasonic handsets. The ergonomic and stylish design, coupled with an abundance of features makes the KX-TG6521 a perfect choice for home usage or more frequent use in the office.